In today’s news for bizarre food in the city, we came across a thali we never expected to see- an epic Bahubali Thali served by the House of Paratha at JM Road. Don’t believe us? Simply keep reading. We’re not even joking when we say we’ve found a Bahubali Thali. The House of Paratha at JM Road is an all-vegetarian eatery that excels in giving the homesick North Indians delicious food they miss so much. Naturally, they have varieties of parathas, tasty dal makhni and so on. But their most stand out item right now is the Bahubali Thali. 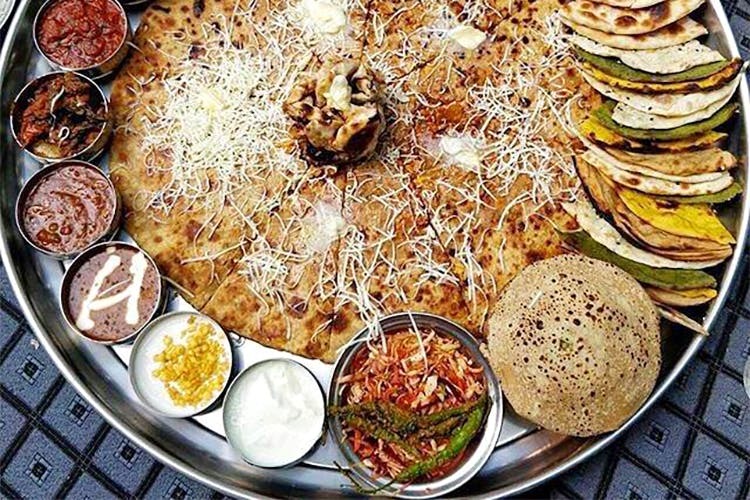 This gigantic thali includes Kattapa Biryani, Devasena Paratha, Bhalladeva Patiala Lassi, Sivagami Shaahi Pakwan and a huge Bahubali Paratha that is topped with butter and cheese. Can you believe that? We hear it’s not easy to finish this one. Priced at INR 1,700 plus taxes, the thali is meant to be eaten by a group of six, so make sure you all get to House of Paratha on an empty stomach. A meal for two at House Of Paratha will cost you INR 550. And, you're definitely going to leave with a stomach full, so its best to wear loose pants when you go. If you want to try the thali, definitely take your foodie gang here so you can try everything on the thali.